Have you ever looked back at old letters or poetry that you’ve written, only to be a bit puzzled by handwriting that doesn’t look at all how you currently shape letters? Or wonder what you were thinking at the time you wrote it, or even if it’s really yours? It’s almost like a geological dig of sorts, reading through a stack of papers that have been sitting forever on a bookshelf, a verbal time machine, taking you back. What was it that Heraclitus once said? “No man ever crosses the same river twice, because he’s not the same man, and it’s not the same river.” I think the same can certainly be said for all of us, including choreographers. It was one of the first years we began giving lecture demonstrations. This one was an overview of the world of dance, beginning with African ethnic, demonstrated here by Leslie Addiego. 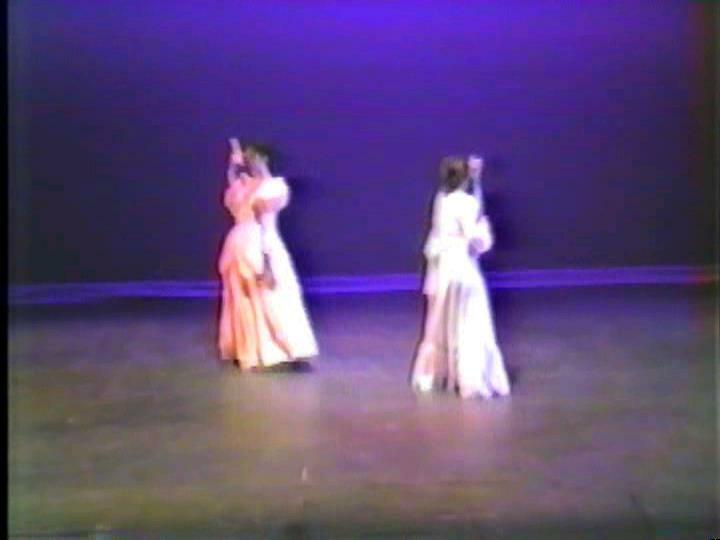 And here, during the lecture demonstration again, are Andrea and Denise demonstrating ballet. A shot of “Moire” the first piece I was ever commissioned to do, this one for the Eastman School of Music in Rochester, New York. It was set to a wonderful piece of music by Reed Holmes. Cultural Affectations was the dance, with lovely costumes that I think were created by Andrea’s mom, Phyllis. Deep sigh… it was the Spring of 1986, and we were getting ready for a show. I’m looking back at old programs now and wondering what I could possibly have been thinking? Dancers in the company were Leslie Addiego, Denise Chakerian, Andrea Needle, Vera Tsai, and myself. Cultural Affectations was really an opportunity to showcase a wide range of dance forms, from my training in African ethnic, to jazz, and modern, while taking a somewhat comic look at how time and cultural perspective changes everything. Television Series was the first of several pieces that explored the influence of television on our lives and Night Logic was one of my first ventures into recording my voice and creating the sound score for a work which I did in collaboration with Chris Bauer. It was a look at how things often feel different in the deep of night… those nights we either can’t fall asleep or wake and feel lonely and apart and not quite ourselves, viewing our lives from a very different perspective than that of daytime.